How many musicians can boast a career ranging from multiple TV appearances including The Tonight Show and Super Bowl XXXVIII to sharing the stage with Steven Tyler of Aerosmith and Willie Nelson? Very few indeed, but Nashville guitar sensation Rich Eckhardt is one of the chosen elite who can claim all of the above and much, much more. Upon moving to Nashville in 1989, his first gig was the Holy Grail of Music City venues -- the Grand Ole Opry. From there Rich began a steady run of touring and recording dates with artists like Rodney Atkins, Blake Shelton, Steve Azar, Eddy Raven, and Mel McDaniel before landing his long time lead guitar position with country music superstar Toby Keith. So how does this Prince George''s County Maryland rock n'' roller become part of the “A” team of Nashville sidemen? I had the distinct pleasure of talking with Rich recently and gleaned some insight on what makes him a Music City Superman. Rich, you have a very distinct flavor that you add to whatever artist you are working with. Can you tell us about your earliest musical influences? Early on I loved the sound of the guitar on Beatles and Monkees records. I realize now that all of the songs I really liked as a kid had great guitar parts -- stuff like “All Right Now” by Free, “Whole Lotta Love” by Led Zeppelin and “School''s Out” by Alice Cooper. I realize you got your first guitar in 5th grade. With that kind of head start on the music world, did you start playing professionally early on in life? I think my first paying gig was at age 13 or 14. We would do teen dances or neighborhood block parties. The whole band got paid something like $35, and we split that four ways. You were a regular fixture in the D.C. area scene for some time. With such a diverse music scene up there what prompted the big move to Nashville? Even though there was a great music scene and some phenomenal musicians in the D.C. area, I knew that if I was going to make a go at this professionally, I would have to move to Los Angeles, New York or Nashville. As more of a rock player, I thought that I would be a unique bird among the flock of country pickers in Nashville. As it turned out, I got here just when guys like Travis Tritt and Garth Brooks started to hit, so artists wanted guitarists that could rock out on their country music, and I started working immediately. You’ve had the distinct pleasure of sharing the stage with everyone from Sammy Hagar to Shania Twain, how did you end up getting the gig with Toby? Purely on reputation. He was looking for a guitarist as I was looking for a gig. His steel player at the time recommended me and Toby said, "Ok, let''s hire him." The cool part about getting in with Toby is that I never auditioned, rehearsed or even sound checked with them before my first show. When Toby heard me play for the first time it was on stage in front of 80,000 people simulcast on the radio! That’s putting a lot of faith in the kind of player he and his band thought I was. Since you have been with Toby for a number of years I am sure there are opportunities to bring your own flair to the gig. Do you get a chance to contribute to the song creation process with Toby? On the live arrangements, yes. We always like to give it more energy, change endings or intros, etc… The band is completely free to do what we want with the music as long as it keeps the audience on their feet. You have a reputation of great tone and knowing exactly what to play. In a town where guitar players can be a dime a dozen your tone has become one of your signature features that helps you to stand alone. Where does this come from? I’ve always paid attention more to guitar tone than fancy licks. I think you can say a lot more with two well-played notes than you can with 200. I am sure part of your signature sound comes from some finely-tuned machinery. What is your primary rig these days? I use various Gibson, PRS, and U.S. Masters guitars through two Kustom ''72 Coupe heads and a Kustom 4x12 cabinet. My processing is an old Roland GP-8, DigiTech harmonizer and a Boss SX-700 multi-effects. On the floor I have a Roland FC-100 controller, EV-5 expression pedal, Boss tremolo, Dunlop wah, Boss TU-12 tuner and an Ernie Ball volume pedal to bring in and out the harmonizer. When I play acoustic I use Taylors. While you have this amazing career that most people would long for, you also have been juggling a successful solo career. Tell me about making the switch to solo artist? For many years I wanted to record an album of my guitar instrumentals, and I finally reached a point where I felt like I had enough material to do an album. I’ve been privileged over the years to work with some killer musicians so I made a mental list of some of my favorite guys and got them involved in the project. They really helped a lot in developing the sound with their personal contributions to the music. I played off of them on my overdubs. With other players all the songs would have come out a bit different. "I think you can say a lot more with two well-played notes than you can with 200." Well, you are obviously a very busy man. What is next for Rich Eckhardt? I’m working on a follow-up to my Soundcheck CD. My approach to songwriting is completely different on this one and it is reflected in the music. I’ll also continue to tour with Toby for as long as he’ll have me. He’s a great artist and easy to work with. Our schedule has settled in where there’s time to pursue my solo stuff and sessions, which keeps me in a bigger piece of the limelight than I could have carved out totally on my own. What advice can you give young players considering a life of being a sideman? Be versatile! You could be doing a rock song and the band leader might say, "Can you give me more of a Don Rich vibe?" If all you''ve ever listened to was Eddie Van Halen and Steve Vai you wouldn''t have a clue what he was looking for. Often people forget the melting pot of guitar virtuosos living in and around Nashville. If you haven’t had the opportunity to check out Rich Eckhardt, you owe it to yourself to do so -- he is a world class musician who is here to stay. For more on Rich, visit richeckhardt.com or check him out on tour. 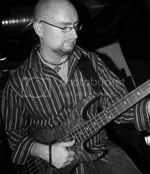 Sean O’Bryan Smith is a professional bassist, producer, and freelance writer. Sean has toured and recorded with such artists as Billy Ray Cyrus, Sara Evans, Rebecca St. James, and Rodney Atkins as well as continuing his ongoing career as an accomplished solo jazz artist. Check him out at myspace.com/seanobryansmith.